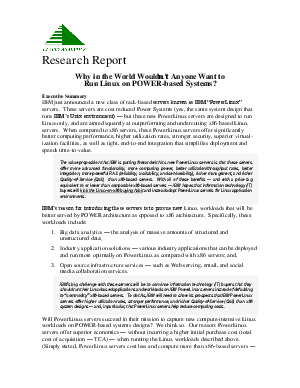 IBM’s new PowerLinux servers appeal to Linux buyers? Linux buyers are driven by the price advantages that Linux offers as compared with other operating environments (Linux is free open source code) Windows and Unix are chargeable licensed code). Linux buyers, therefore, look first and foremost at the total cost of acquisition of Linux based servers. Linux buyers also want rapid time to value (fast deployment); they often use decentralized procurement processes; they want their Linux servers to be simple to use and manage.